Bryan Phillips has been actively sailmaking for 51 years and the founder of Phillips Sails. Bryan's knowledge of sailmaking stems back to his early days in Balmain. Bryan still has a keen eye for a sail & continues to hand craft a limited amount of sails. He is actively servicing sails & rigging from time to time. Bryan is trying to live a semi-retired lifestyle while sailing regularly at most opportunities. Craig Phillips started sailmaking for North Sails in 1984 and has traveled extensively around the globe with various sailing projects. His current employment has him Sail Loft Coodinator for BMW Oracle Racing which he joined in 2007. After the successful Emirates Team New Zealand Challenge, Craig moved onto new challenges with the newly formed Russel Coutts team at Oracle Racing. 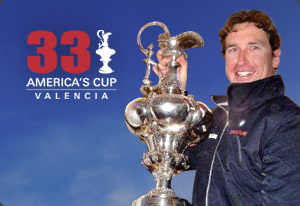 This is Craig's 7th America's Cup in which he has been part of the forefront of sailmaking technology. Craig still enjoys the hands on approach & designs sails for his local area. He continues to sail Formula boards & has an Olympic Star Class which he enjoys sailing on Lake Macquarie.